The Pacific Tree Frog's habitat ranges from Northern California to Southern Alaska. It is known for croaking loudly when spring begins. This is a sign to the Coast Salish of Vancouver Island that it's time to end the winter ceremonies and prepare for the hunting and fishing season. 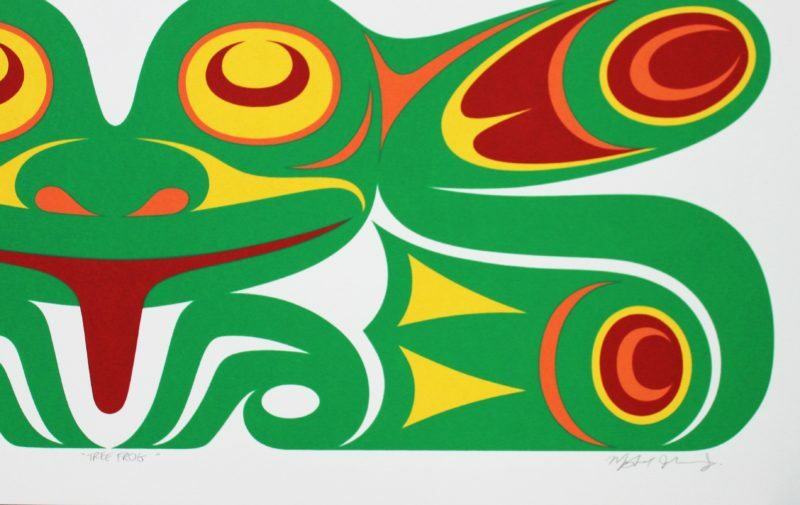 According to Northwest Coast culture, the Frog is believed to inhabit the human, as well as the spirit world. As such, Frog is the communicator between the two worlds. This limited edition silkscreen print titled "Tree Frog" by Maynard Johnny Jr. was hand produced by the screen printing process. It is the only limited edition printing of this design. The artist has inspected and signed each copy in the edition. All trial copies of this edition have been destroyed and the printing stencils obliterated.